Undertittel A laugh-out-loud sparky romcom! 'The perfect balance of romcom and drama!' GRAZIA She kissed the groom. She's not the bride... Edie thought she'd found The One...until he told her he was marrying someone else. And on the day of his wedding, when he kisses her, life really does go pear-shaped... Labelled as a home-wrecker and office outcast, when her boss offers her the chance to get out of town Edie jumps at it, even though moving back in with her eccentric father and prickly sister isn't exactly the escape she needs. When her work throws her into the path of rising star and heartthrob Elliot, Edie is expecting a highly strung diva. 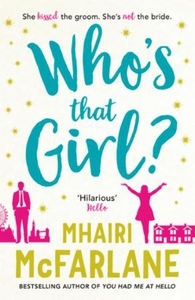 But as their unexpected friendship develops, Elliot isn't the only one in the spotlight... Who's that girl? Edie is ready to find out.